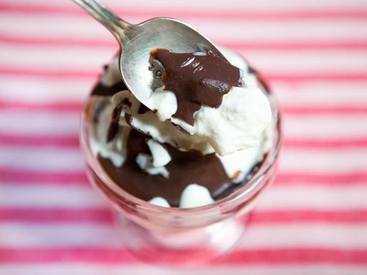 Make your own chocolate dip! It's National Chocolate Ice Cream Day! Is Magic Shell, the ice cream topping that miraculously hardens into a chocolate candy shell, the world's greatest ice cream topping? I can't say for sure, but it's definitely the most fun. Now what if you want the Magic Shell concept but with a bolder, darker, better-tasting chocolate flavor? Or what if you want to make your own ice cream bars? You're in luck, because this stuff is easier to make at home than the ice cream you drizzle it on.